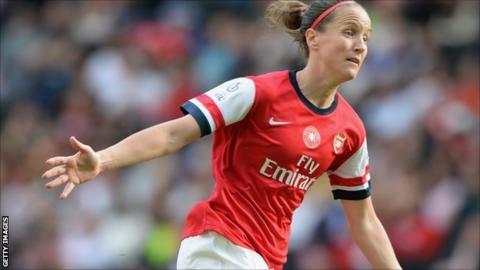 Arsenal lifted themselves off the bottom of the Women's Super League with a 1-0 win at champions Liverpool. In caretaker boss John Bayer's debut after the resignation of Shelley Kerr, the Gunners got their first win of the season through Casey Stoney's goal. Birmingham City retained top spot with a 2-0 win against Manchester City. Chelsea climbed to second after a goal by substitute Ana Borges, seven minutes into her debut, clinched a 2-1 win at bottom-of-the-table side Everton. After winning the FA Cup final under Kerr in their last outing, Arsenal gave Bayer a fine start to his temporary stint in charge. But the experienced technical director of the club's girls' centre of excellence confirmed that he has not applied for the manager's job on a full-time basis. Bayer saw Liverpool make the early running and go close when full back Lucy Bronze's 25-yard drive was tipped over the bar by goalkeeper Emma Byrne. As Arsenal came into the game, right winger Danielle Carter was twice denied from distance by Liverpool keeper Danielle Gibbons. Five minutes before the interval Gibbons pulled off a diving save from right-back Alex Scott's low 18-yard effort. But 10 minutes after the break, the keeper dropped a Carter corner and central defender Stoney forced the ball over the line from just a couple of feet out. The scores should have been levelled seven minutes later but striker Natasha Dowie, clear of the Gunners defence, shot wide of the inviting target. That miss proved costly as the visitors played out the remainder of the game with no real scares to hand the Reds their first WSL defeat of the season. Birmingham striker Hannah Keryakoplis wasted the best chance of the first half, heading over the bar from a pinpoint Linnett cross in the 34th minute. But Linnett made no mistake two minutes after the interval, firing home a loose ball to record her fifth league and cup goal of the season. As the visitors hit back, Betsy Hassett struck the crossbar with a good shot and seconds later Natasha Flint's deflected effort hit the post. But Birmingham's victory was confirmed when, two minutes from time, central defender Kerys Harrop headed the goal that kept her team top of the table. Striker Eni Aluko gave Chelsea a 13th-minute lead, squeezing the ball home from a tight angle after goalkeeper Rachel Brown-Finnis had saved her first attempt. Brown-Finnis then kept out shots by Japanese striker Yuki Ogimi and Aluko as the visitors threatened to run away with the game. But Everton drew level with a great 37th-minute goal by striker Nikita Parris, who raced clear to chip over keeper Christiane Endler and into the far corner. Either side of half time, Aluko was denied again by Brown-Finnis, but Chelsea went back in front after 67 minutes. Central defender Gabby George lost possession to Portuguese midfielder Borges, who drove into the penalty area to score from 12 yards.